The WEA representatives included Rev. Geoff Tunnicliffe, Secretary General of the WEA, Gordon Showell-Rogers, Associate Secretary General of WEA, Ndaba Mazabane, Vice Chair of WEA International Council, and Hansjörg Leutwyler, General Secretary of Swiss Evangelical Alliance. As they toured Dorasan Station, the Joint Security Area (JSA), and the Demilitarized Zone (DMZ) near North Korea, they prayed over the divided Korea. Rev. Tunnicliffe said, "Korea is a country divided into North and South. Perhaps the biggest hope of Koreans including Korean Christians is unification. At the coming General Assembly in 2014, Christian leaders from around the world will pray for the unification of the two Korea's. "When I was young, I prayed for three countries - Saudi Arabia, Albania, and North Korea. I hope that God's power may be revealed during the General Assembly. There are still pains of severe poverty in North Korea. I pray that in these next three years as we gather all Christians to prepare for the General Assembly, we may bring the love of God to North Korea." After witnessing the divided situations, Rev Tunnicliffe expressed his hope for the Korean churches and for the General Assembly in 2014. "Unity should be the pursuit of all churches. But we find the true sense of unity when there is diversity. It'd be very easy to unite if churches are uniformly similar. But every church is different. If the Church can unite among diversity, only then can the power of Gospel be testified," Rev. Tunnicliffe remarked. 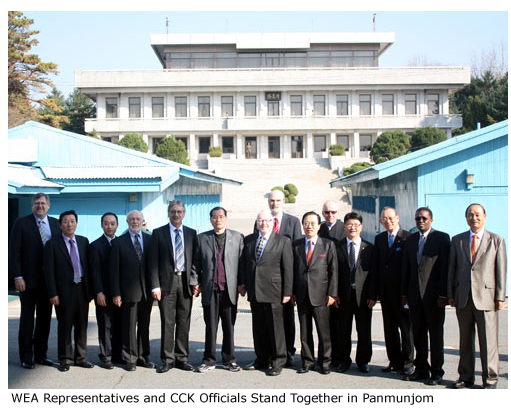 "The General Assembly held in Korea will provide the opportunity where churches can unite. Churches around the world will learn from the Korean Church, and at the same time, Korean Churches can learn from churches around the world. We believe that God will work powerfully at the General Assembly in Korea impacting Christians worldwide. For the next three years we work diligently to prepare the General Assembly as an opportunity for the world to celebrate with all Christians."